Cowls are the simplest way to practise and develop your helical knitting. Kat adapted the Garter Gaiter from Purl Soho, working it in helical stripes to avoid the inevitable jog line. 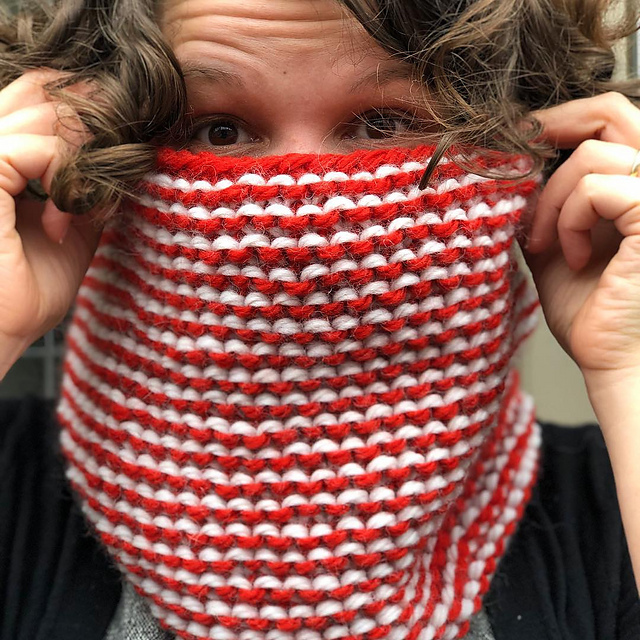 Natasha also adapted a cowl pattern. Her Bramante cowl features a striking contrast i-cord at the top and bottom to match a pair of mittens she knitted earlier in the year. Once you have mastered the basics, it’s pretty straightforward, with a little concentration, to move onto shaping, while keeping the striping going. Maylin has finished her Momo hat in Something to Knit With Aran in Mist and Mustard and Alix has used subtle striping in her own design beret. The SN2LA Helical Knitting KAL runs until the 9th December. Whether you a making one of the designs from the book, a helical design from elsewhere, or adapting a pattern to become helical, do be sure to share your photos, progress and questions in the forum thread.